Guadalajara is Mexico's second largest city, and a great destination for vacationers seeking a taste of authentic Mexican culture. Dating back to the 16th century, Guadalajara's rich cultural heritage is evident everywhere you look, and this full-day excursion combines the majesty of this colonial gem with some of the best shopping in Latin America. 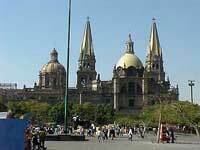 The Guadalajara Highlights and Shopping tour begins with a relaxing 45-minute flight from Puerto Vallarta to Guadalajara. As we pass over the stunning Sierra Madre Mountains, you'll enjoy scenic views of towering canyons, deep-carved riverbeds, a patchwork of Blue Agave plantations and extinct volcanoes that dot the landscape. 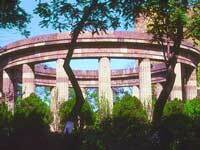 Guadalajara is an incredibly diverse and stately city with amazing qualities, both modern and historic. The birthplace of Mariachi music, Guadalajara is home to Mexico's most inspiring 16th century architecture, monuments, fountains, parks and tree lined avenues, and we'll spend the morning exploring the historically rich treasures found in the heart of the "Most Mexican of all Mexican Cities." Next, we'll visit the Tlaquepaque neighborhood of Guadalajara, a Colonial-era suburb known for its locally crafted works of art, ceramics and antiques. The prices here are far lower than in Puerto Vallarta, and the shaded pedestrian streets and European architecture create a wonderful atmosphere for the delicious lunch you'll enjoy before we continue on to the open-air shopping district of Tonal?. Many of the ceramics, pottery and finest dinnerware sold all over M?xico are made by the estimated six thousand artisans living in Tonal?. This village of craftsmen features open workshops which sell to the public, making a stop in Tonal? a must for savvy shoppers. Our Guadalajara Highlights and Shopping tour offers adventure travelers a taste of authentic Mexican culture and one of the world's greatest shopping experiences, so don't delay - make your reservations today! Runs: Tuesdays from 8:30AM to 4:00PM, October through April only. Includes: Lunch, Beverages, Round-trip flight to Guadalajara, ground transportation to Tlaquepaque and Tonala, guided tours of Guadalajara, Tonala and Tlaquepaque. Kids: Suitable for All Ages. Notes: This tour requires at least 8 people to operate. If less than 8 people sign up, the tour may be cancelled. This tour cannot operate in bad weather, due to the small airplane. If the weather is poor, the tour will be cancelled. In both cases, you will receive a chance to reschedule or a full refund.